The English Indices of Deprivation 2015 is an official measure of deprivation and provides data for areas including local authorities. It updates previous versions published in 2010, 2007, 2004 and 2000. Sandwell’s average deprivation score has improved slightly since 2010, falling one place to become the 13th most deprived local authority out of a total of 326 (where 1 is the most deprived). However, this does not necessarily mean that deprivation in the borough has improved – only that it has improved relative to other areas. Sandwell's neighbour Birmingham is also among the 20 most deprived Local Authorities by average score (ranked 7th). The table above shows that Birmingham is now worst in the West Midlands on all indicators, as the most deprived local authority in the conurbation. On most measures Sandwell is the most deprived local authority within the Black Country. The relatively high ranking on extent compared with a lower ranking on local concentration reveals that Sandwell's deprivation is spread across the borough rather than being concentrated in certain hotspots. The map shows the distribution of deprivation across the borough at the smallest available geography - Lower Super Output Area (or LSOA - small areas with around 1,000 to 2,500 residents in the 2011 Census) and shows which of the ten national deciles (10% bands) the 186 Sandwell LSOA fit into. The darker the shade, the more deprived the LSOA - although deprivation can vary within an LSOA. Large areas of Smethwick, Tipton, Wednesbury and West Bromwich are heavily deprived. 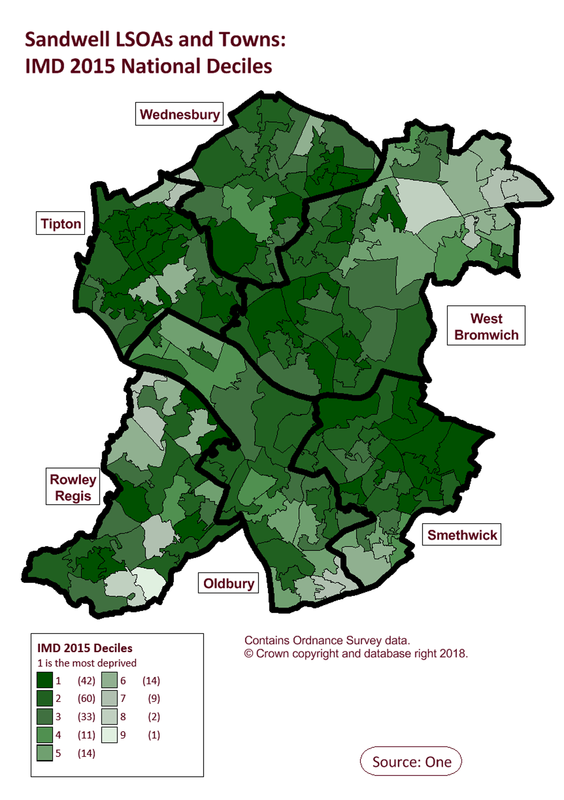 The less deprived Sandwell areas are represented by lighter shades and can be seen in the north east of West Bromwich, and the peripheries of Smethwick, Oldbury and Rowley Regis. One in five of Sandwell’s LSOAs fall into the most deprived 10% nationally in 2015. This shows a relative improvement, as around 30% of LSOAs were among the 10% most deprived in both 2007 and 2010. A further third fall into the most deprived 10-20%, so overall 55% of Sandwell’s LSOAs fall within the worst 20% nationally, and 86% within the worst 50% nationally, clearly displaying the high levels of deprivation prevalent in large parts of Sandwell. 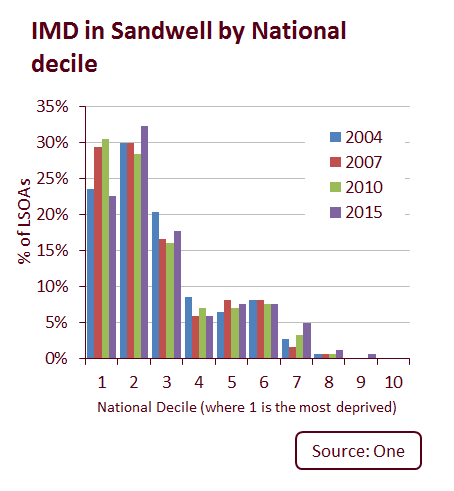 No Sandwell LSOA are in the least deprived decile nationally. The English Indices of Deprivation are the Government's official measure of multiple deprivation, published by the Department of Communities and Local Government (DCLG). The most recent, the Index of Deprivation 2015, published October 2015, updates previous versions published in 2010, 2007, 2004 and 2000. New indices are planned to be published in 2019. They are then combined, using appropriate weights, to calculate an overall measure of 'multiple deprivation'. The results are published at local authority and Lower Super Output Area (LSOA) level. There are 186 LSOAs in Sandwell, each containing between 1,095 and 2,757 people in the 2011 Census. Each LSOA is given a score for each domain. This is then used to rank all 32,844 LSOAs in England, with the most deprived being ranked as 1. It is a relative measure, placing areas in a position relative to each other. Click here to see the national analysis. Click here to download the national datasets.